Effective January 2, 2014, the Department of Consumer and Regulatory Affairs (DCRA), Occupational and Professional Licensing Administration (DCRA/OPLA) has implemented several changes to the security licensing process and fee schedule to improve the level of ease, efficiency, and overall administrative function of security licensing. DCRA/OPLA has engaged Pearson VUE to facilitate processing of all license applications and license renewals for private detectives, private investigators, special police officers, and security officers. Though processing will no longer be handled by the Security Officers Management Branch (SOMB) of the Metropolitan Police Department, the SOMB will still accept payment and perform the final signoff of each application at the SOMB office located at 2000 14th Street, NW, Room 302. To apply, all new license applicants and license renewals must complete an application, provide fingerprints for a criminal background check, and submit passport size two color photos. New applicants must also provide information pertaining to employment and residential history, a criminal history affidavit, birth certificate or naturalization documentation,and submit to a drug screening and a physical. Security officer applicants will be required to take a test based upon the D.C. Municipal Regulations in Title 17, Chapters 20 and 21. Special Police Officer applicants are also required to submit a DD-214 (Military Service Record/ Discharge Record and Separation Documents) and a range certification and gun list. Fees are now based on two year terms rather than the previous one year term, and must be paid at the time of application in the form of cashiers check, money order, or certified check payable to the Pearson Vue and D.C. Treasurer in two separate payments. Security Officer’s license will be valid for two years with an affidavit submitted annually. Special Police Officer’s license will remain on the yearly license period. 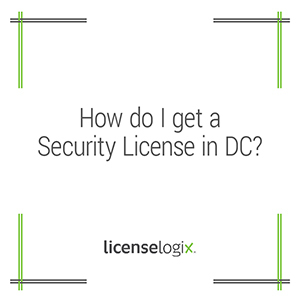 Don’t let this lengthy process prevent you from providing security service in DC! Let LicenseLogix’s skilled Account Managers determine what changes affect you and your business, compile and complete all necessary paperwork on your behalf. To get started, click here or call us today at 800-292-0909.